They were the prophetic words of Jamesie when a team called Aqua Force Barnsley appeared in the Sheffield County Senior League. 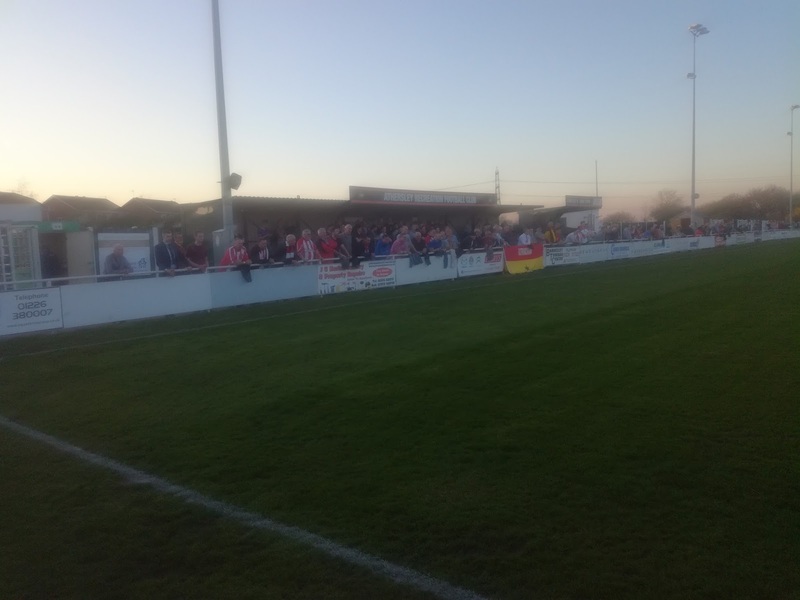 It turned out the club was actually previously known as Worsbrough Common, and they were plying their trade in the second tier of the league, but in 2011 when the owner of Barnsley based firm Aquaforce, Craig Wood, took over the club, things were about to change. 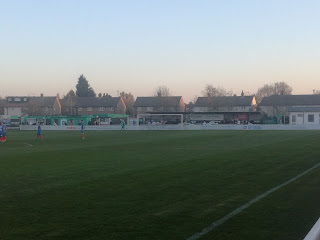 A second place finish saw them promoted to the Premier Division and with it came a further name change to Shaw Lane Aquaforce, which reflected the clubs location at Barnsley Rugby Club on Shaw Lane itself. 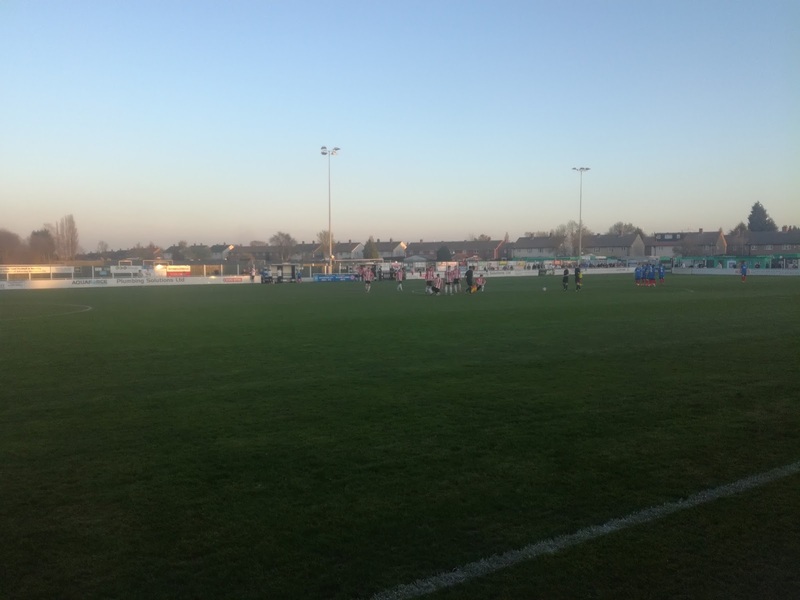 The championship was won at the first attempt and suddenly the club found themselves in the First Division of the Northern Counties East League, and not only that, they were raising a few eyebrows with both their progress and indeed the quality of player they were attracting. I saw them at home during their first season in the NCEL and was impressed with what I saw, both on and off the field, so it came as no surprise when the runners-up spot saw them promoted to the Premier Division. A similar tale continued in the Premier Division, the Championship was won while the FA Vase quarter final was also reached along the way. 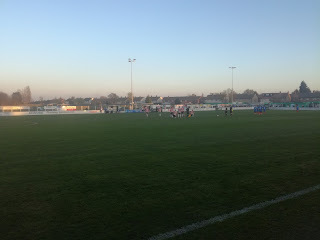 Promotion to the Northern Premier League followed, but despite finishing second in their debut season, they lost the Play-Off Final to Coalville Town. It was all change in the Summer of 2016, the club dropped the Aquaforce from their name (the powers that be don’t like sponsors in clubs names), but also they moved to the Sheerien Park home of neighbours Athersley Recreation, partly due to the quality of the pitch at Shaw Lane. No mistake was made this time round with the Championship won, but alongside joy came tragedy with the awful death of defender Daniel Wilkinson who passed away after collapsing during a game with Brighouse Town. So, the Premier Division has been reached, and as we near the end of their first season at Step 3, it was worth reflecting on not only the season but also the clubs remarkable progress. After a positive start which saw the club look like they could once again make another leap up the pyramid, they were hampered by multiple postponements due to the bad weather, but coupled with that they had a fantastic run in the FA Cup which saw them reach the First Round Proper. The home defeat to Mansfield Town was shown live on television, and if anything was to encapsulate just how far this club has come, then that game would be it. Since then, form has been a little inconsistent, coupled with the departure of manager Craig Elliott to Boston United, so going into the final month of the season the aim was to try and achieve a play-off place, but that’s far from a shoe in. Tonight’s game against Altrincham was going to be a really big test. Alty knew a win would put them within touching distance of the Championship and an immediate return to National League North, but to be fair, a club of that size should not really be playing at this level. 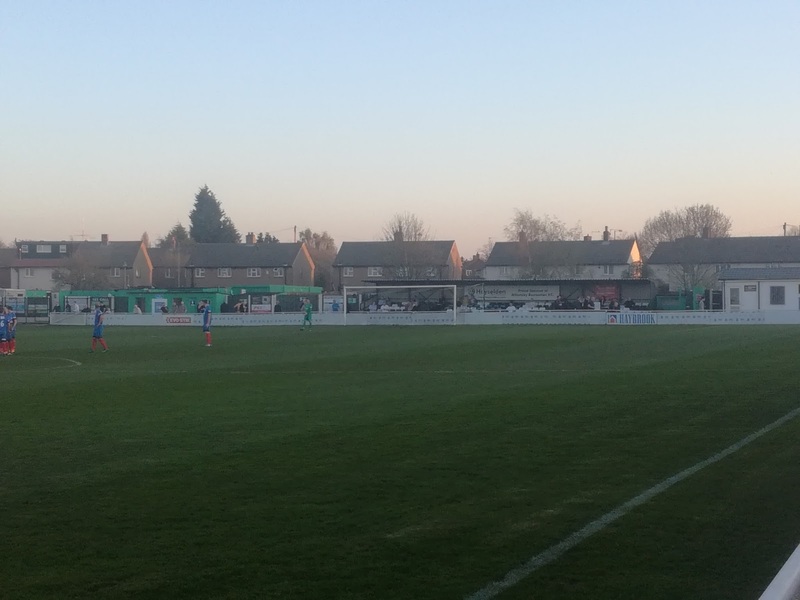 Once the biggest name in non-league football, the fans crave for anything close to a return to former glories. On a beautiful evening I weaved my way through the North of Barnsley to the estate that is Athersley & New Lodge, before spotting the tight entrance to Sheerien Park. The ground is a real mix of structures, some of which have clearly been added since my last visit to ensure the Step3 grading is met. Upon entry through the turnstiles, two sections of covered terracing, one larger than the other sit to the left, and fill the area from the corner flag to the half way line. 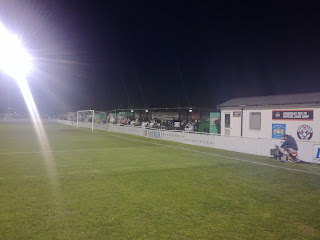 Behind the bottom goal for half of the length of the pitch is a seated stand (Atcost), while behind the opposite goal to the top of the ground is another smaller seated stand, again of the pre-constructed variety. The top end of the grand is a real mish-mash of buildings making up the dressing rooms, the tea bar, the club house, a club shop and a hospitality area. Many of the buildings are of a portakabin / temporary nature, while outside of the perimeter fence is another fully railed pitch that is the home of Grimethorpe Sports FC . 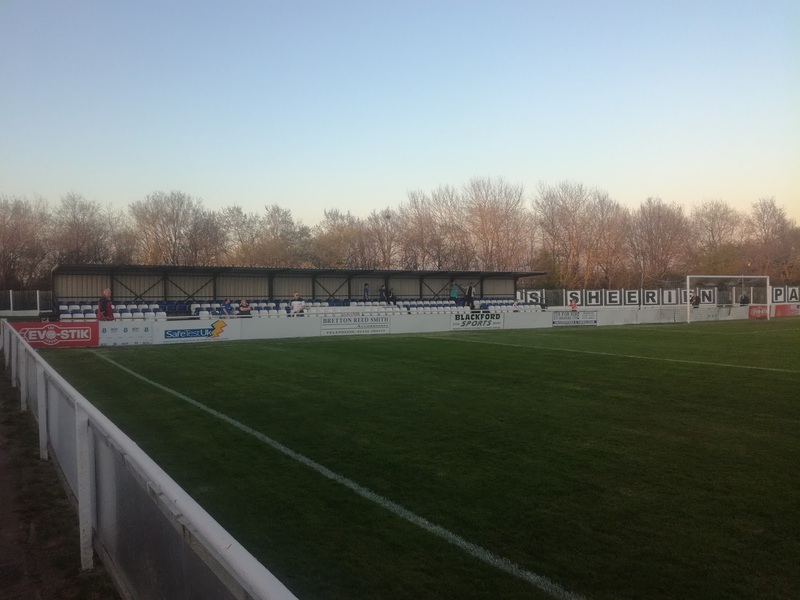 I understand that an awful lot of the initial work carried out at Sheerien Park, to allow Athersley Recreation to get to the NCEL, was funded by ex-professional and former player Geoff Horsfield. If that is the case, and I have no reason to suspect it isn’t, what a fantastic gesture that was. It’s a busy ground, it’s a tidy ground, and it does the job. But, it’s Athersley’s ground, and what the medium to long term plans of Shaw Lane are, I don’t know. But you do feel they need to put down some roots to at least start to create some local identity, because their existence so far has been a little nomadic. Shaw Lane is a road in Barnsley, and they have moved away from that, and I recall they did have plans to change the name to Barnsley Town, but that was rejected. But, with a super ambitious and committed owner in Craig Wood, you know that he will make the correct decisions to allow the club to prosper. How did they fare in the game? With almost 300 spectators in the ground, of which half travelled from Cheshire, it was a very tight and competitive first period, in which John Johnston gave the visitors the lead with a fine solo effort only five minutes before the break. 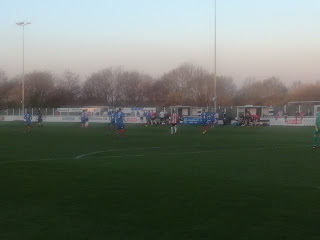 Former Alty striker Damien Reeves equalised just three minutes later for Shaw Lane from the penalty spot, and that looked to set up a pulsating second period, but for the vast majority it was quite a mundane and tight affair, until the game moved into the final five minutes when Joshua Hancock forced the ball home for the visitors to send the travelling support in raptures. 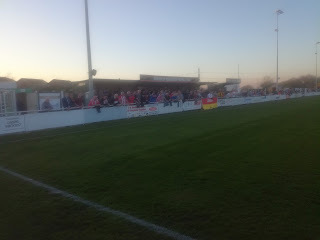 At the final whistle, Alty celebrated, knowing just a point was needed to secure a swift return from whence they acme, while Shaw Lane knew that they simply had to win their remaining games, and rely on others slipping up to make it to the Play-Offs. It was interesting reading Craig Wood’s commentary in the programme before the game. He talked about the progress of the club, and irrespective of the final outcome this season, it had been a success in his eyes. The play-offs would clearly be a fantastic achievement, but if that doesn’t happen, I certainly wouldn’t bet against them being a serious contender for automatic promotion next time around. Keep an eye on them was the advice – and I’m not the only one these days. With the story far from over, there are a few chapters to go just yet. Yes, cynics will sneer at one man’s money / play thing and all that, but this for me has been done the right way, with the club looking to move forward on and off the pitch at a pace that is sensible and manageable. I draw comparisons with Basford United, a not dissimilar story, and you know what, without the likes of Craig Wood and Chris Munroe at Basford, football in these parts would be a much poorer place.